Like the rest of the country, Phoenix was "booming" in the Twenties, its population soaring from a few thousand at the turn-of-the-century to over 29,000 in 1920. By this time, Phoenix had become the largest city between El Paso and Los Angeles, and was transformed from an agricultural area into a thriving retail, professional and governmental center. Suburban areas built during this period were inhabited by a population newly made mobile by the automobile, the desired mode of transportation for the average American family by the mid- I920s. The Palmcroft and Encanto Subdivisions not only reflect this trend toward suburbs planned for an automobile oriented population, but they also incorporate a number of design influences which distinguish American communities developed between the two world wars. More than simply mass-planned subdivisions, Palmcroft and Encanto are illustrative of the City Beautiful or Garden City designs, a fully realized comprehensive approach to suburban planning which includes a unification of architecture, community planning and landscape design. This approach has its roots in the 19th century's picturesque, romantic suburbs. These movements called for innovative street plans, street landscaping, ornamental light fixtures and parks integrated into the housing areas. Dwight B. Heard, a New Englander who had moved to Chicago and then to Phoenix in the late 1890s, was a central force in the development of Phoenix in the early 20th century. A publisher, developer, and political activist, Heard was a friend of Theodore Roosevelt and was instrumental in the creation of the Roosevelt Dam. The Dwight B. Heard Investment Company purchased 80 acres, north of McDowell bounded by 7th and 15th Avenues on the east and west, from the half-section estate of James W. Dorris in 1926. This parcel was split into two equal plats and the 40 acres east of 11th Avenue were developed first. Heard's associate in the Palmcroft development was William G. Hartranft, developer of the Kenilworth subdivision, pioneer advocate of city planning in Phoenix, and father of the city's park system. Together with surveyor Harry E. Jones, they devised a plan for a highly ordered scheme of curving streets contained in I/ I 6-section grids. A plat was filed on April 27, 1927 and by the end of the summer, streets had been graded and the first two model homes completed. The brochure for the subdivision asked, "Why is Palmcroft the ideal?" and answered with descriptions of "contemplated palm bordered winding drives," and its "quiet and clean" location 11 only five minutes by auto from downtown." Sewer, gas, water, sidewalks, ornamental lights and palm trees were included with the price of a lot, which ran from $850 to $2000. Deed restrictions ran from $5000 for houses built on North 11th Avenue and West Palm Lane, to $6500 on all other streets except West McDowell, which was zoned for apartments and duplexes. Palmcroft proved to be an immediate success and a year later Heard set out to repeat it. A second Palmcroft, identical in planning and building restrictions, was laid out west of the original Palmcroft on the second parcel of 40 acres between North 11th Avenue and North 15th Avenue. The new Palmcroft formally opened early in 1929. Three of the most significant homes in Palmcroft should be noted for their influence over the entire area. The one -story brick structure at 1609 Palmcroft Drive SE was the first model home in Palmcroft. Built in 1927 on speculation by Heard and Hartranft, the Arizona Republic said "...considerable time and study has been spent on the planning of the first two houses which will be built by the Heard Company as it is its intention to set a high standard for the homes to be erected in the new subdivision." The second model home, also built in 1927, at 1808 Palmcroft Drive NW was designed by Phoenix architect H.H. Green. The thick walls, entry porch and its arched window evoke the aura of Old Spain. Its imagery proved persuasive, for most of the houses subsequently built in the two Palmcrofts were designed in the Spanish Colonial Revival Style. The oldest house in the second Palmcroft, 1615 Palmcroft Way SW, is a Spanish Colonial Revival completed in 1928. It was built on speculation by the Dwight B. Heard Investment Company to promote sales in the second Palmcroft. As in the rest of the country, the federal government played a central role in reviving Phoenix' economy. Programs of the Federal Housing Administration (FHA) were first introduced to Phoenix in October 1934. In that same significant year, West Encanto was replatted and a number of acres were sold to the City of Phoenix for parkland-hence the designation West Encanto Amended for the area north of Palm Lane and west of 11th Avenue. 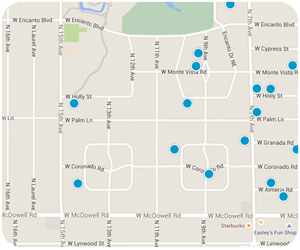 Many of the houses in the Encanto-Palmcroft District were built in the years following using FHA-insured loans. The architectural style of Encanto's model homes was distinctly 11 Southwestern," in contrast to the Period Revival styles being built in Palmcroft. The building restrictions of Encanto went far beyond those of Palmcroft. The minimum cost restrictions for residences ran from $10,000 to 12,000 and only single-family dwellings were permitted throughout the subdivision. Detailed instructions for building lines were also enforced in order to maintain consistent angled setbacks, which followed the line of the streets. The house at 745 West Monte Vista is notable because George T. Peter, one of the two developers of Encanto, lived in this home, on site, for several years. Built in 1928 as one of the model homes, the unusual entry tower and its prominent location distinguish this Monterey style dwelling. At 1102 and 1106 West Palm Lane are the first two homes constructed in that section of Encanto while it was still part of the overall scheme to fill the second Encanto Circle with houses. For the most part, the residents of Encanto and Palmcroft were well to-do rather than wealthy. The very rich were still living in older mansions closer to downtown, in established subdivisions like Los Olivos, and on "Millionaires Row" along Central Avenue. Among the prominent Phoenicians living in Encanto-Palmcroft were Nathan Diamond, co-founder of Diamond's department store; O.D. Miller, produce magnate, state senator, and gubernatorial candidate; Lynn M. Laney, attorney and Board of Regents member; and automobile dealers Shadwell H. Bowyer and W. Claude Quebedeaux. Another popular feature of Encanto Park was "Kiddieland," an outgrowth of the children's playground in the original park. Believed to be the oldest carousel in Arizona, the carousel in Kiddieland was moved to the park from California in 1934.
picturesque. Mass, materials, texture and color were manipulated in a conscious attempt to emulate the asymmetry and sensuousness of nature. The result is both dramatic and understated. Many of the houses here were constructed in traditional styles. Others were designed to invoke the romantic notions of past architectural periods. A number of Phoenix based architects contributed to the district. Orville Bell and H.H. Green were among the most prolific. Additionally, the prominent firm of Lescher and Mahoney designed the original buildings for Encanto Park. Regional expression was also in vogue at this time. Not surprisingly, a wide range of styles is found in the district. The styles of particular note are those influenced by southwestern traditions. Spanish Colonial Revival and Mediterranean are the most predominant, although excellent examples of Pueblo Revival and Monterey Revival styles can also be found. Spanish Colonial Revival stylistic elements include low-pitched roofs with little or no overhang, red tile roofs prominent arches over doors and windows and porches, and an asymmetrical facade covered with stucco. A large, formal example of this style is the Nathan Diamond house, located at 2220 North 9th Avenue. Very similar are the Mediterranean or Neo Mediterranean homes, which usually have stucco walls, round arched windows and doorways and tile roofs. Pueblo style dwellings were normally built of adobe or of brick stuccoed to resemble adobe. Like the Native American building traditions from which they are named, these homes featured flat roofs with the characteristic timber vigas and rainspouts. The vigas, protruding timber ends that originally were part of the structural support of buildings of this style, were often only ornamental by this period. Low-pitched roofs with red tile also were used in conjunction with this style as it developed. Two fine examples of the Pueblo Revival Style in the district are located at 2040 Encanto Drive Southeast and 702 West Monte Vista Road. Monterey Revival is essentially a fusion of Spanish Colonial and American building styles, which developed in Monterrey, California. A generally symmetrical, two - story, rectangular building and full projecting porches at the second story, characterizes it. The Pafford house, located at 1021 West Encanto Boulevard, is a good example of this style.